First published in MUDL Magazine (September 2014 edition). I find it difficult to believe, in moments when I reflect on it, that until this year we did not have access locally to one of the most prominent whiskey styles in the history of the drink. It was a sad reality – at the risk of being melodramatic – which we’ll hopefully never have to face again. It’s sadder still that there were many long bleak years during which its very existence hung in the balance. This dismal state of affairs is luckily now a thing of the past. 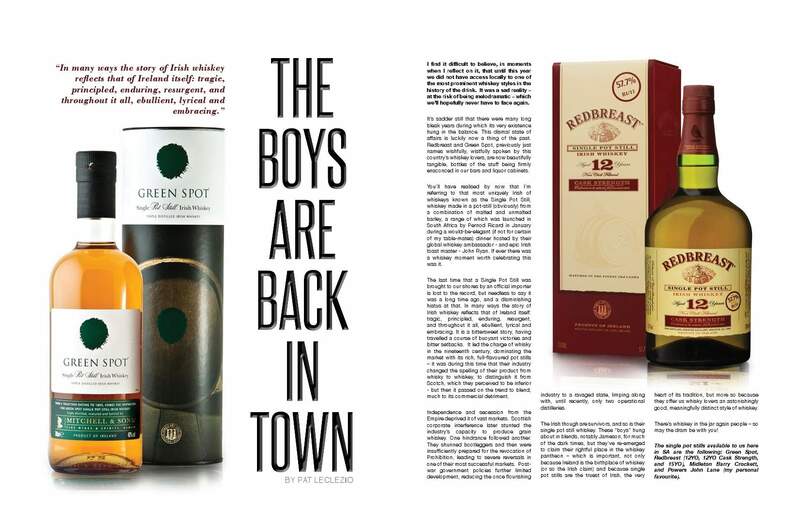 Redbreast and Green Spot, previously just names wishfully, wistfully spoken by this country’s whiskey lovers, are now beautifully tangible, bottles of the stuff being firmly ensconced in our bars and liquor cabinets. You’ll have realised by now that I’m referring to that most uniquely Irish of whiskeys known as the Single Pot Still, whiskey made in a pot-still (obviously) from a combination of malted and unmalted barley, a range of which was launched in South Africa by Pernod Ricard in January during a would-be-elegant (if not for certain of my table-mates) dinner hosted by their global whiskey ambassador – and epic Irish toast master – John Ryan. If ever there was a whisky moment worth celebrating this was it. The last time that a Single Pot Still was brought to our shores by an official importer is lost to the record – but needless to say it was a long time ago, and a diminishing hiatus at that. In many ways the story of Irish whiskey reflects that of Ireland itself: tragic, principled, enduring, resurgent, and throughout it all, ebullient, lyrical and embracing. It is a bittersweet story, having travelled a course of buoyant victories and bitter setbacks. It led the charge of whisky in the nineteenth century, dominating the market with its rich, full-flavoured pot stills – it was during this time that their industry changed the spelling of their product from whisky to whiskey, to distinguish it from Scotch, which they perceived to be inferior – but then it passed on the trend to blend, much to its commercial detriment. Independence and secession from the Empire deprived it of vast markets. Scottish corporate interference later stunted the industry’s capacity to produce grain whiskey. One hindrance followed another. They shunned bootleggers and then were insufficiently prepared for the revocation of Prohibition, leading to severe reversals in one of their most successful markets. Post-war government policies further limited development, reducing the once flourishing industry to a ravaged state, limping along with, until recently, only two operational distilleries. The Irish though are survivors, and so is their single pot still whiskey. These boys hung about in blends, notably Jameson, for much of the dark times, but they’ve re-emerged to claim their rightful place in the whisky pantheon – which is important, not only because Ireland is the birthplace of whisky (or so the Irish claim) and because single pot stills are the truest of Irish, the very heart of its tradition, but more so because they offer us whisky lovers an astonishingly good, meaningfully distinct style of whiskey. There’s whiskey in the jar again people – may the dram be with you! The single pot stills available to us here in SA are the following: Green Spot, Redbreast (12YO, 12YO Cask Strength, and 15YO), Midleton Barry Crockett, and Powers John Lane (my personal favourite). Watch this space for a more detailed evaluation of these fine whiskeys. This entry was posted in Uncategorized and tagged Green Spot, Irish, Midleton, Powers, Redbreast, Single Pot Still, Whiskey. Bookmark the permalink.